Most numbers in the Bible are symbolic and not to be taken literally. The account in Numbers of over 600,000 men of arms, plus women, children, and flocks leaving Egypt is hyperbole. This would be estimated at a population of between 1 million to 2.5 million persons. Indeed, the number 600,000 is highly symbolic. The 6 comes immediately before 7 and 7 symbolized fulfillment or perfection. There are 5 lunar cycles; the ancients didn’t have a zero/zed. The five lunar cycles total 60 (5 X 12 cycles). Add 60 and 6 = 66 men of arms, probably accompanying a group of between 200 and 500. Keep in mind that the highly polished Exodus narrative was told long after the time of Joseph. In Joseph’s time the Hebrew chiefs moved back and forth between Egypt and Canaan rather freely. Judah's tryst with Tamar is an example. The number 40 appears in narratives in both the Old and New Testaments. 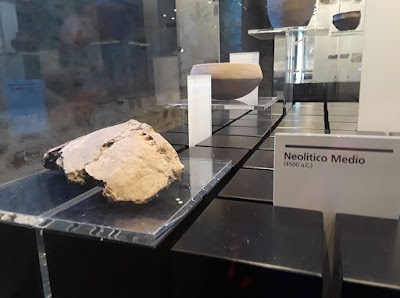 It has a Nilotic context, as the Nile flood lasted forty days. The number 40 does not appear in books that have a Babylonian context, such as Esther and Daniel. Sometimes numbers are avoided entirely because the writer did not know the exact figure. Here is an example from Exodus 18:12: Jethro (Yitro) offered a burnt offering and other sacrifices to God and “Aaron and all the elders of Israel came and ate with Moses' father-in-law in the presence of God." The phrase “all the elders” is vague because the writer did not know the number of elders. He could as easily have said 70 elders, 40 elders or 12 elders. Or, had he written 23 or 71, it would reflect knowledge of the number of men appointed as elders in the Sanhedrin. John’s Revelation speaks of 24 elders in 19:4 and 12 foundations to the New Jerusalem. The text tells us that the foundation stones represent the 12 apostles. Are we to take this literally? It is clear that the meaning pertains to how the New Jerusalem is founded upon the Apostles or the Apostolic Witness. In Revelation we read about 7 churches, 7 seals, and 7 bowls. Most readers recognize the connection between the number 7 and divine acts of creation, remembering the 7 days of Genesis 1. The Masoretic text of Genesis 5 assigns Lamech the Younger 777 years. He was Noah’s father. However, the Septuagint assigns Lamech the Younger 753 years, and the Samaritan Pentateuch assigns him only 653 years. In his extraordinary Commentary on Genesis (Volume 1), Umberto Cassuto wrote, "What is the cause of the divergences between the three texts, and which recension has preserved the original figures? Much has been written on this subject, and the answer remains in dispute" (p. 265). Cassuto believed that the original figures are preserved in the Masoretic chronology. Those are the numbers I will use here to demonstrate how numbers are sometimes used in Scripture to show patterns. Cain murdered his brother and tried to hide his crime from God. Cain deserved to die, yet God showed him grace by sparing his life. Cain was marked with a protective sign and was banished. Reflecting on this grace shown to his ancestor, Lamech the Elder brags to his wives and challenges God to show him greater grace than was shown to Cain (7). He claims a greater measure of grace (77). Lamech the Younger, son of Methuselah (Genesis 5) is assigned even greater grace because he is said to have lived 777 years. 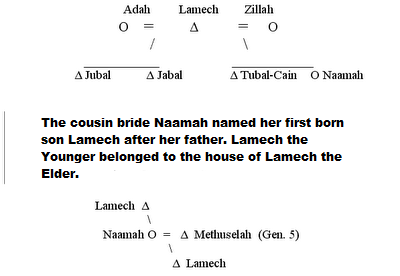 This Lamech is the son of Methuselah and his cousin bride Naamah, and he is the father of righteous Noah. Jerome's observation is significant. Those who lived before the flood are not old because the numbers assigned to them are symbolic.